Finding the perfect gift for that special someone who follows the Specific Carbohydrate Diet can be a grand adventure. Considering that many normal gifts are now out of the picture, where does one get started? Glad you asked, so I decided to compile a list of my favorite SCD items. Harry and David gift basket? Uh, No Thanks. Bag of organic unsalted blanched almonds…Oh My Gosh how did you guess?? Versatility is the key to a great kitchen gadget and the Excalibur doesn’t disappoint. Make perfect SCD yogurt every time with precise temperature control. Create personal SCD snacks like dried vegetable chips and fruits or make your jerky snacks. Honestly, the list goes on and on and is only limited to your imagination. Great for the person who might have all the standard basics covered or the SCD road warrior. The right pan can make or break every dish you cook. There are plenty of higher-priced stainless steel cookware sets to choose from, but none rival the performance and value of this set. I own a diverse collection of All-Clad, Cuisinart and Calphalon pans and nothing compares to the price and performance of the Cuisinarts. Perfect for the new or old SCD’er alike who might need a major kitchen upgrade! A handy gadget that cuts down on cleanup time and safety hazards. Stick blenders are wonderful for soup and smoothie making. The cleanup is about 30 seconds, which is much shorter when compared to traditional blenders. The other huge benefit is you can purée foods like soups right in the pan you cook it in. At this price it is worthwhile addition to any kitchen. The SCD diet is heavy on natural foods and anything you can do to minimize food preparations is a value added addition to the kitchen. 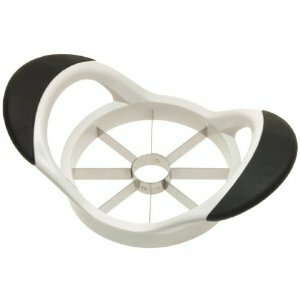 Enter a sharp, nicely handled apple corer, removes lots of slicing and coring for all types of fruits. Best for those who like to cut their hands while working in the kitchen, but not bad for anyone looking to reduce kitchen time. A reliable and accurate timer is extremely important for many areas of the SCD kitchen. Burn an almond flour recipe or two or ever multitask and forget about the pan on the oven? Yeah, been there haha! This timer is an extremely easy and effective way to get rid of all these problems. The thing is like indestructible and when it goes off it’s loud and annoying: two important things for my hectic life. Best for the new baker, or the forgetful multi-tasker. Best purchase I made all year. I got more use, less cramps and cut my peeling times in about half compared to the old trusty rusty peeler. It’s a small investment that I think everyone who is preparing natural foods will enjoy. Everyone will enjoy this one, the best part is the ergonomic handle. 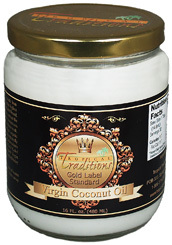 Hands down the best of the best when it comes to quality in coconut oils. This stuff is like duct tape for the SCD life. Yeast and Bacteria overgrowth? It’s anti-microbial. Want to gain weight? It has 110 awesome calories per tablespoon. Cooking oil? Yes. Face moisturizer? The best. Hair Gel? I told you… everything. 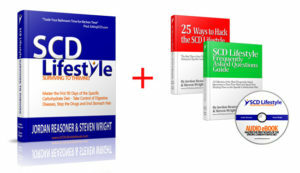 Now you can create the best SCD legal pancakes on earth! Love this stuff. The original, and in my mind still the best, time-tested cookbook available for the Specific Carbohydrate Diet. It includes a wide range of recipes that cater to beginners and some that will even challenge the best cooks. Because of this, I see it as a cookbook that grows with you as you learn on the diet. 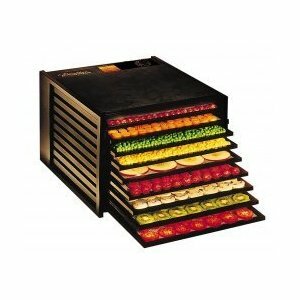 Best for the SCD chef who needs to expand their diet. Come on now people… having a digestive problem doesn’t mean we have to be no-fun Nancy’s does it? Poking a bit of fun at something we take so seriously is a great way to talk about our problems openly with loved ones as well as remind you that you can’t take this life too seriously, especially if its your 8th time in the bathroom that day. 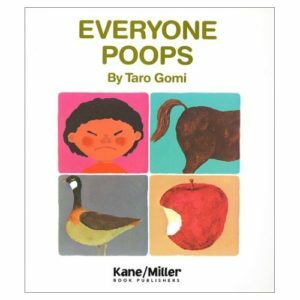 Great for people who Poop. SCD legal personal care products are hard to find. If you take your diet seriously, sooner or later you will probably look into changing out all that aluminum and glycerin you slather under your arms. Enter Pit Putty – granted you could probably make this at home, but can you shove it into a deodorant stick and put a sweet label on it? Yeah, me either. Great for the all organic household, toxin-free people and you stinky kids (you know who you are). Again, if you’re tired of putting man-made crap on your lips and are looking for a low toxin organic alternative this might be your ticket. There are plenty of flavors but unscented is best for minimizing allergens. Nothing like a little shameless self-promotion for the holiday’s right? But seriously with our 365-day money-back guarantee it’s like the best Christmas gift you could give. No financial risk and no gift receipts needed! 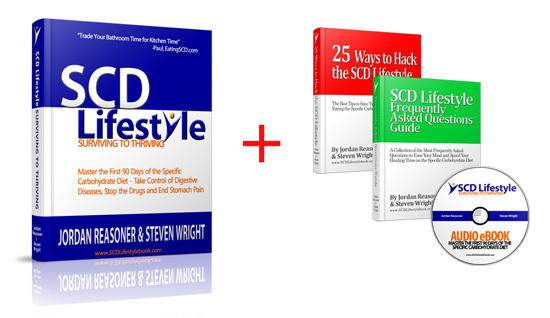 If you know someone who needs an extra push to start SCD or needs an extra level of knowledge on SCD, then our books are perfect! Not to mention no wrapping required – or you could fill a big box up with peanuts and then tape the receipt to the bottom – I’m just saying it might be fun! I hope everyone has a Merry Christmas and happy holidays! If you have some other cool ideas, leave them in the comments below! P.S. – Note: We earn a small commission if you use some of the product links in this page to purchase the products we mention. We only recommend products we would use or have used in the past. Your purchase helps support our site and ongoing research. Great Ideas Nia and Tracee! Here’s one more item that is a must for the SCD traveler: A multi-compartment pill case! Most drug stores carry them and they range in size and price from $2.00 to $10.00. I got a large one for overnight trips and a smaller one for the car for day trips! Other ideas: A nice jar of honey, Sea Salt, The cookbook “Healing Foods, Cooking for Celiacs, Colitis, Crohns and IBS” is a gorgeous cookbook, and the Everyday Grainfree cookbooks are nice too. Tom’s from Maine toothpaste (or similar) for those who don’t want flouride in their guts.